Have you ever heard the urban legend about alligators living in the sewers of New York City? 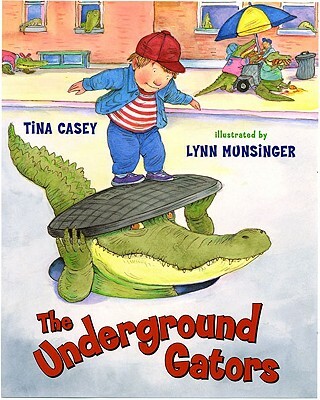 Well if you want to know the truth, look no farther than The Underground Gators written by our very own Tina Casey! Tina actually worked in the sewers of New York City for the Department of Environmental Protection, so she knows the real scoop on alligators living under the Big Apple. This slapstick picture book begins by dispelling the urban myth about alligators living in the sewers of New York City: “To be honest, nobody has ever really seen them.” Then Casey hedges a bit. Just because there hasn’t been an eyewitness, she reasons, doesn’t mean that the alligators aren’t there. Together, Casey and Munsinger try to make a case for the ’gators’ existence, and the result is this over-the-top, comedic offering. All kinds of mysteries can be explained, it seems, by adding the alligator angle. Why are manholes round? So that the pizzas that alligators love to order can be easily passed through. What do babysitters do after kids go to bed? They play cards with alligators. There is a lot more silliness than sense here, but Munsinger makes it work in hilarious scenes of the endearingly goofy reptiles marching through the human world, from summer school to a child’s bedroom, where they stand in for the tooth fairy. I applaud your efforts to inspire kids to go green through the magic of stories. I am on the same mission, and have published the first two books in a series of Eco mysteries, The adventures of the Sizzling Six. Keep up the good work.